Take a Peek at Pediatrics! Whenever I give prospective students a tour of our facilities and classrooms during Information Sessions, the Pediatrics classroom tends to get a lot of “oohs” and “aahs.” Rightfully so! Half of the classroom is filled with colorful things to jump on, climb on, swing on, and crash into, which certainly looks a lot more fun than most classrooms I’ve seen! 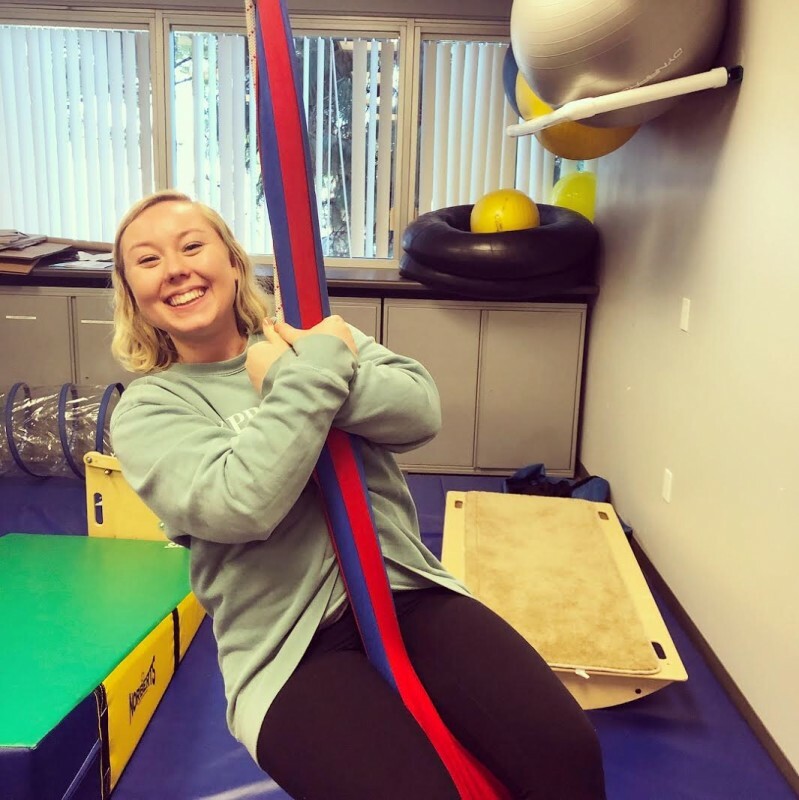 OTs who work in Pediatrics definitely try to make everything they do with their pediatric clients fun and engaging, and the same can be said for our Pediatrics professors. I spend 9 hours each week in my Pediatrics class, but it’s so much more than a lecture with my professors talking at me the whole time! The course integrates team application activities, case studies, and a lot of exploring and trying out different assessment and intervention approaches. I’ve already told you about my Fieldwork experience in a school-based setting, but now let me give you a peek into my Pediatrics course! I don’t have pictures for privacy reasons, but we had the opportunity to interact with children and with parents when learning about doing parent interviews and conducting standardized assessments. As a class, we got to practice interviewing a parent of a child who receives OT services, and he was able to give us feedback about how we did. Additionally, professors bring their children into the lab, so we can look at their primitive reflexes and learn about how to conduct standardized assessments. We learned that it’s a lot harder than it looks, but that it becomes easier as you get more familiar with the assessments. 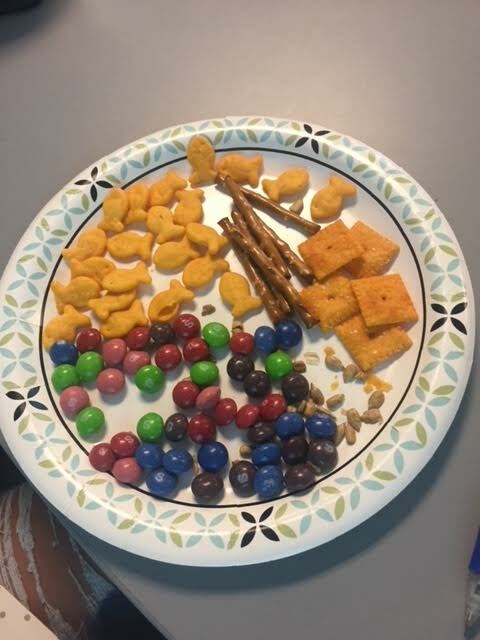 When learning about different grasps (how we manipulate our fingers and hands to grab objects) our professors brought in some snacks. Grabbing yummy snacks and bringing them to our mouths was definitely an inherently motivating and fun way to review the various types of grasps. I realized that we grab a sunflower seed differently than we grab something bigger like a cheese-it, which is something I hadn’t thought about before. Next time you’re eating a snack, pay attention to how you pick up your food to eat it! When practicing planning treatments that address different fine motor skills, our professors put random objects on the table and told us to come up with a fine motor skill treatment using those objects on the spot! 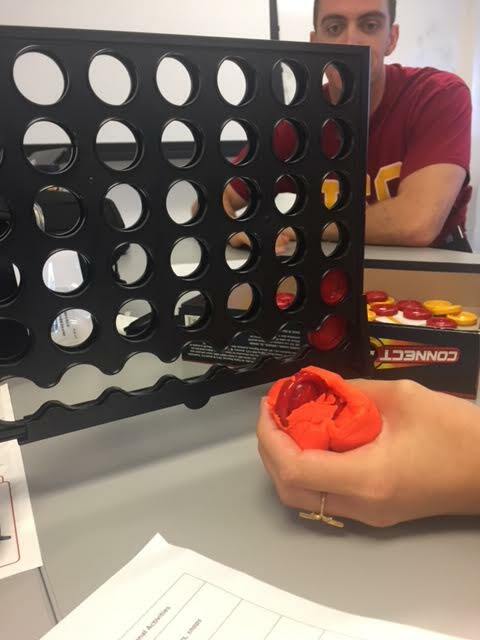 My group had play-doh and Connect 4, so we decided to hide the Connect 4 pieces inside the play-doh. That way, by manipulating the play-doh, the child is building up strength in the small muscles in their hands. Then, we can address grasp when looking at how they hold the Connect 4 pieces. We also came up with ways to change the activity to make it more challenging and less challenging. It may look simple, but there’s a lot of thought behind each pediatric treatment! Lots of different games can be used in OT! 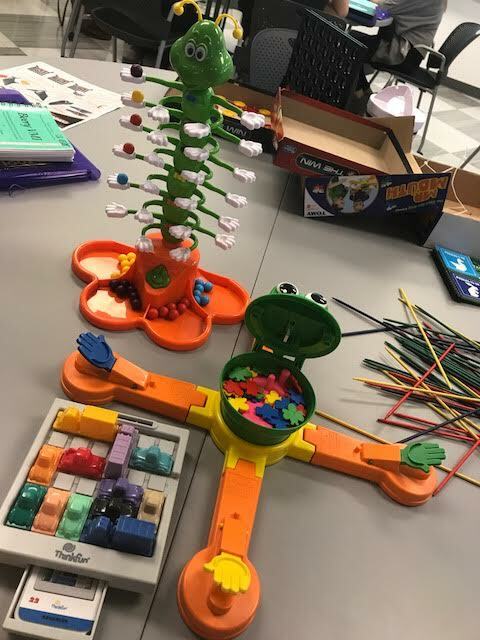 When learning about visuomotor integration (how our vision and perceptual skills work with our fine motor skills to help us interact with our environment efficiently), we got to try out a lot of different games and think about how they could be used in treatment. One of my professors said something that really stuck with me: generally, the children that OTs work with may have a hard time playing a game exactly as it is designed or following the exact direction. This means that it’s the OTs job to adapt the game and make it the right challenge for each child, allowing them to work on certain skills, but feel successful and have fun at the same time. 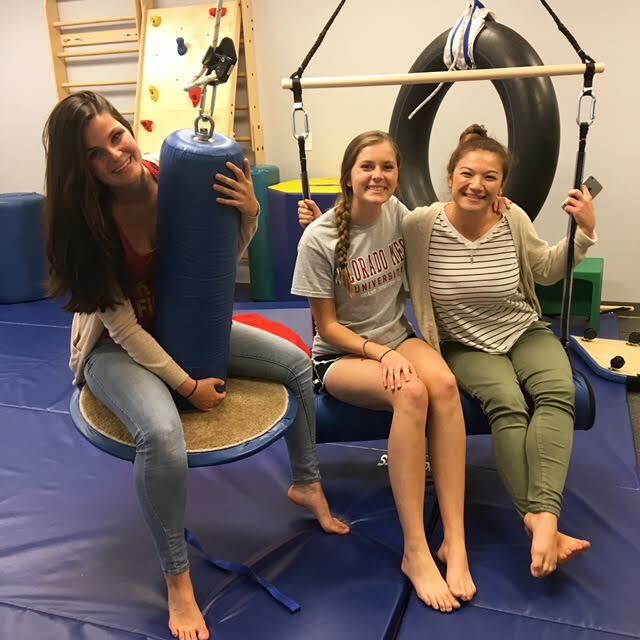 OT treatment with children can often look like play, but there is a lot of work going on at the same time! Some of the materials used in the Handwriting Without Tears Program. I practiced using the wooden blocks to put together a few letters! When learning about handwriting interventions, we got to explore the Handwriting Without Tears program, which aims to do exactly what the name sounds like! 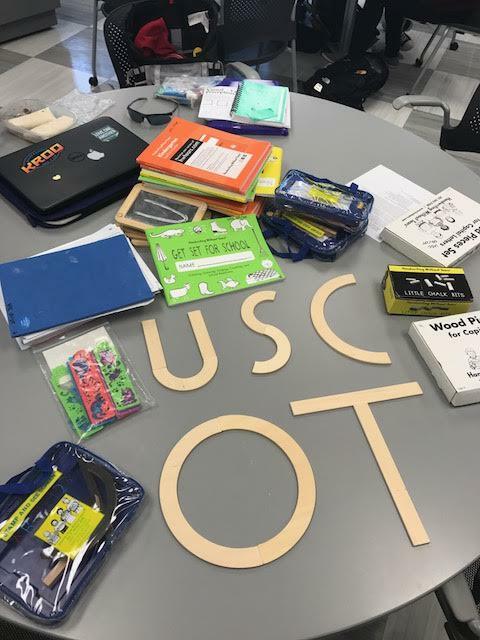 For children who have a hard time learning to write or making their writing legible, working on handwriting in therapy could start to feel boring and like work, so a couple of OTs created the Handwriting Without Tears program to make handwriting intervention more dynamic and fun. Children can practice writing on an etch-a-sketch and chalkboards and can form letters with play doh and wooden blocks. This program uses a multisensory approach and has a lot of different options to make treatment fun and different. I’ve used this program used at my fieldwork site, and the kids definitely enjoy it! Getting a little vestibular input from one of the swings! Check out some of my classmates on other swings! 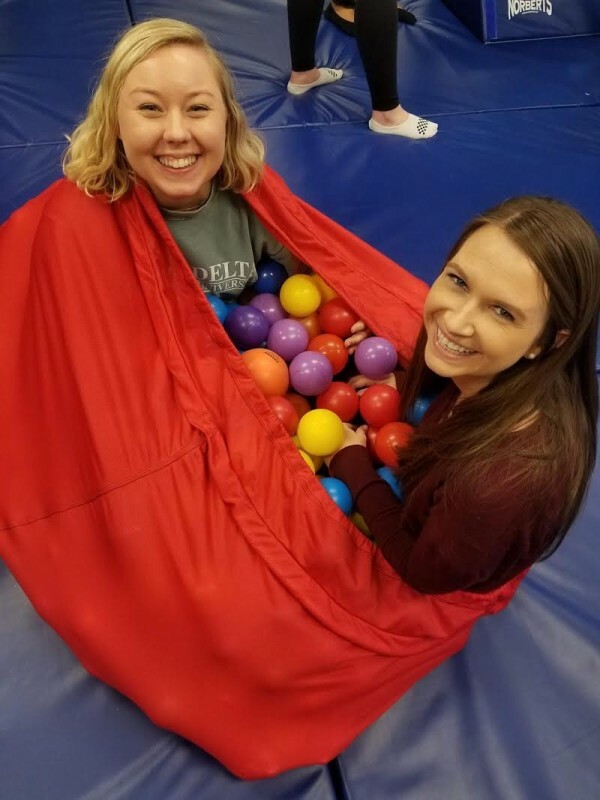 Finally, last week we were learning about Sensory Integration theory and intervention, which was actually developed by A. Jean Ayres, a former OT faculty member here at USC! We learned all about our sensory systems, how they’re supposed to work, what it can look or feel like when they’re not working as they should, and what Sensory Integration can do to help. My professor reminded us that you should always try out an activity yourself before having a child do the activity in therapy, to ensure that it’s the right level of challenge and actually addresses what you want the intervention to address. So, we did exactly that! We explored the lab space and got on different swings and equipment to see what it feels like, how challenging they are, and how our bodies feels afterwards. It was such a fun day! Just two peas in a pod getting some tactile input! I’m so appreciative of all of the time and effort my professors put in when planning the course and the time spent in the classroom. I’m definitely a learn-by-doing kind of person, so I love when I get to be hands-on in the classroom. My pediatrics midterm is coming up next week, so I’m definitely starting to reflect on everything I’ve learned this first half of the semester. Wish me luck!